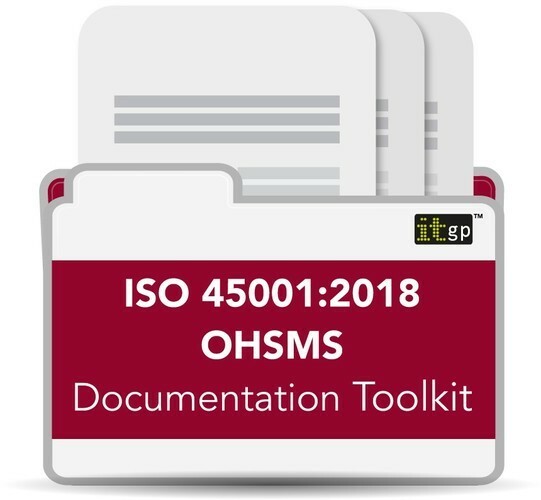 Take the stress out of your OHSMS compliance project with our comprehensive ISO 45001 Documentation Toolkit. According to the report Global Estimates of Occupational Accidents and Work-related Incidents 2017 there are over 2.78 million deaths and 274 million non-fatal injuries and illnesses per year as a result of occupational accidents or work-related diseases. By creating and maintaining an OHSMS (Occupational Health & Safety Management System), employers can reduce workplace incidents, improve staff morale and increase productivity. ISO 45001:2018 is the international standard for creating and maintaining an OHSMS, replacing OHSAS 18001. Whether you need to transition your organisation from OHSAS 18001 to ISO 45001, or you are implementing your first OHSMS project, our toolkit will help you save time and money in gaining ISO 45001 certification. Why choose the ITGP ISO 45001 Documentation Toolkit? Reduce the costs of your compliance project. Our comprehensive set of tools and templates provide everything you need to implement an ISO 45001-compliant OHSMS. Save time with our customisable templates. Efficiently create policies and procedures so that your organisation and employees see the benefits as quickly as possible. Have confidence in your documentation by using our fully compliant toolkit to generate your evidence. Stand out from the competition. By complying with an international standard, you will prove to your employees, clients, prospects and other stakeholders that you follow best practice and take responsibility for the well-being of your staff. Comprehensive coverage of the Standard, our toolkit contains 75 documents including tools, templates and guidance notes. Get started on your stress-free ISO 45001 project – buy our toolkit today. Make sure this toolkit is right for your organisation, download a free trial. The documentation templates are compatible with Microsoft Office 2016, 2013, 2010 and 2007. If you use a Mac®, an older version of Office or Office 365, please contact team@itgovernancepublishing.co.uk. If the toolkit is updated within 12 months of purchase, we’ll send you the newest version for free. Please note that this does not include updates that are made as a result of changes to the Standard.